However, is there is a way to write your Research Proposal such that all the different stakeholders will be happy with it? Academics and students attending your COC Seminar? to dispel some of the myths about how to write an effective Research Proposal. to give you an exemplar of what I think a good Research Proposal looks like, for you to take away. 2. 1: What is a Higher Degree Research Proposal? Why is it important to undertake this journey? Why is it significant to go on this journey? What do I hope to discover as new? How am I going to travel this journey? How will I know I am going the right way? How will I know I have reached my destination? A higher degree research proposal (RP) is a document that provides to others, all the essential information about the project you propose to undertake as part of your study for a higher degree. What Purposes Does the Research Proposal Serve? To gain attention and interest of academics who might be your supervisors. 3. What Does A Good Research Proposal Look Like? This should be a comprehensive summary of your RP, which is so worded that it makes sense to a reader who is not a specialist in your proposed field of research. a statement of your tentative argument about filling that gap. How relevant it is to your life, your career or profession. What is already known about your topic? Why is it important that the problem I have identified be investigated? What contribution will the investigation make? How original is this contribution to the discipline? Why is this research worth pursuing? What is the theoretical and practical importance of the outcomes of my research? Which are the issues on this topic and how will my research address these issues? What are the expected outcomes and why are they important? How does my research link with what has been done in this field? How can my research complement what is happening in this area? Is there some way I can use my research to extend an existing model or way of thinking or analysis? What really justifies my research? State its scope, aims and objectives that are SMART;I.E; Simple, Measurable, Achievable, Realistic, and Time-framed. State exactly what you want to learn as a result ofconducting your proposed research. What do I intend to prove or disprove? What shall I understand more deeply, analyze, evaluate or create? What shall I test and demonstrate? Which are the broad aims, and which are the specific objectives I seek to achieve? The literature review is intended to demonstrate that you have a good grasp on the literature in the field of your proposed research, that you can use it well in your research, and you can contribute to it. It offers greater contextualization of your study based on what others have done in your area of proposed research. How does what has been done link with what I want to do? What do leaders in the field say about the problem I propose to investigate, relevant theories, methodologies and paradigm? Which are the major issues on this topic? Which gaps does the literature highlight? Which hypotheses or research questions can I formulate based on this literature? What debates are going on in this area and how can I contribute to those debates? Is there a thesis I can review to see how it is structured and the type of literature that it reviewed? Which research issues are evident in the relevant literature? A research question is that cardinal question which centers your research efforts and focuses them on mounting a scholarly argument that helps you to solve the problem identified as important for your research. So, the RQ is the question, which indicates to you, and to your supervisors, and examiners of your thesis what you want to know. It comprises the questions whose answers will enable you to make a contribution to knowledge. Since this is what you get awarded a doctoral degree for, you need to formulate it very well. The question/s need to be important, open-ended, requiring complex answers, but answers you can provide, as a result of your research. The RQs usually comprise the main research question that addresses the main aim of the research, and is often referred to as the overarching research question, followed by a few research questions that unpack the overarching research question by addressing very specific objectives of the research, and are called subsidiary research questions. Because the RQ provides the basis for your argument, remember that most arguments are not presented or won by Yes or No answers. Neither should your RQ be one that can be answered with just Yes or No responses. Most Yes or No answers do not explain complex ideas, concepts, or themes. Yet for a research proposal for a HDR project to succeed, it must be judged as having the potential to contribute to an understanding of a relatively complex issue or problem. The theoretical framework articulates the theoretical views expressed by leaders in the field into which you plan to research, which you make the foundation for all your sense making of the meaning contained in your data. I argue that trying to conduct a HDR project without grounding it in a well-articulated TF is like trying to erect a building on shifting sand. Such a building would have no foundation. Views on the importance of a TF differ, but at Sydney Uni where I was a Master’s student in the 80s, there was a very clear understanding that you could get away without a TF in a Master’s thesis, and may be, even in an EdD thesis, but definitely not in a PhD. Ideally, the Theoretical Framework should emerge from your literature review. If, as you prepare your RP, you haven’t found one (i.e. a TF) in your literature, it is because you haven’t looked hard enough, or you haven’t been creative enough. Keep looking, and you will eventually find one. Is there a theory that will help me to make sense of the meaning of the data I will gather to answer the RQ/s? What do giants in the field of my proposed research say about the problem I want to investigate, from theoretical perspectives? How can I modify what they have said, so as to come up with my own theorization about the meaning contained in my research data? Which Research design will you follow? E.G: Case study, survey, phenomenology, ethnography, hermeneutics, narrative inquiry, grounded theory, experimental, correlational? Why? In which Paradigm will you locate your research? Positivist, interpretivist, critical or pragmatic? Why? Which Research method/s will I use? Quantitative qualitative or mixed methods? Why? Who will be the Participants? E.g: individuals, groups, focus groups? How selected? How many? Why? How will I Gather the Data? E.g: which Procedures shall I follow? E.g: travel or fieldwork. Why? Which Instruments will I use? For example, will my data gathering instruments include questionnaires or online or mail surveys or interview guides and questions? How will I Analyze the data? For example, will I undertake thematic collation, relational analysis, axial coding, statistical algorithmic, or statistical equations? Which Tools, Software, or Data management procedures shall I use? Methodological Limitations. Ask yourself, are there any? How will I work around them? Which are the Ethical considerations? Ask yourself, are there any ethical issues? If so, how will I address them? Will I need the EAF or the NEAF? This should present a schedule of all activities showing the sequence of your research phases and when you propose to start and complete each. To achieve this aim, you should tabulate data which make it very clear that you have a reasonable understanding of the time that you will need for each major part or step of your research study, and therefore your research proposal is doable within the time of your candidature. One possible good way to design such a Table is to tabulate the different steps of your research proposal and show what you will do in each step, when, and how much time you plan to spend on each. How much time does the university/my government allow me to complete my thesis? Realistically, given my personal circumstances (work, family, travel, health, relationships, other), when can I start and when will I finish each step? What other deadlines do I have to meet during my candidature? Which are the different chapters I will need to develop? Have I allowed for time to discuss the development of my thesis with my supervisors? Have I allowed realistic timing for each step? How will I tell that I am making good progress? Will I need to travel to meet with my supervisors during my RP preparation? Will I be staying overnight and therefore needing hotel accommodation? Will I need to purchase any research materials, such as published reports? Will I need a new computer or new software? Will there be printing costs? Have I made arrangements to meet all those costs? Which other resources or services will I need? E.g. Transcription, programs? Training? This is a very tentative indication of the proposed structure for your thesis. It is a good idea to show that you have thought about this, but do not spend much effort on this activity, since your thesis plan will most likely change many times as you develop your thesis. The plan should at least indicate the sequence of the proposed chapters for the whole thesis, and possibly how many words in each chapter. The total number of words for a Masters degree is about 60,000 – 70, 000 words. For a PhD this varies in the range 80,000 – 100, 000 (Dunleavy, 2003). There is great variance in these numbers and so you should discuss these with your supervisors. I use the metaphor of a plateau when advising my doctoral students on the word limits in each chapter. I refer to the first two or three chapters as climbing up the gentle upward slope of a plateau. So these chapters increase in word limits in the upward order of 7,000, 8,000, 9,000. The next three chapters sit on flat top of the plateau, so they each have an equal amount of words, say, 10,000, 10,000, and 10,000. The last three chapters descend the downward slope of the plateau with decreasing number of words such as, 9,000, 8,000, and 7000. 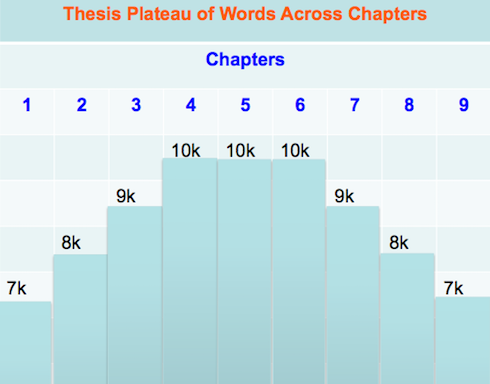 Following this plateau, you would end up with a thesis of nine chapters with 78,000 words. By the time you include the preliminary leading pages, plus references and appendices, you are likely to end up with a document about 100,000 words all up. These must be compiled following the APA Styles manual (APA. 2012). Your reference list is not a bibliography. Therefore, you should include in it, only those publications you have cited in the different parts of your Research Proposal, not everything you have read.